Globecast launches new Remote Production service for broadcasters. Amsterdam, September 2016: Globecast is announcing its pioneering new Remote Production service at IBC 2016. This innovative solution enables Globecast customers to think differently about what events they cover and how, bringing together a variety of premium technologies to create a brand new acquisition service. Globecast’s Remote Production offering turns the concept of traditional supply of a ready-to-broadcast feed from venues on its head. Initially targeting major live sports broadcasts, this new remote production service will enable content owners, be they major event rights holders or local events promoters, to more easily select from multiple source feeds or content distribution feeds, whether via their own global locations or from feeds provided by international broadcasters. Globecast’s Remote Production service will allow its customers to create bespoke programming in their local studio, on their own production systems, and prepare their own customized ready-to-broadcast feeds. More importantly, customers can eliminate the need to send dedicated production teams to different locations, avoiding technology, travel and personnel costs that are now part and parcel of covering a major live sporting event. 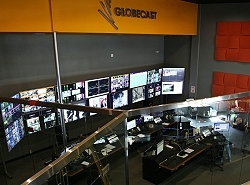 Globecast is now putting in place the technology to provide efficient access to source feeds - directly from cameras and elsewhere - to international broadcasters at key Globecast Media Center handover points, with delivery in secure IP format. A combination of the company’s compression and overall transmission skillsets is powering the creation of a low latency, highly scalable network around which the service will operate.